Last Fall, I went to Victoria to view an old loom and a weaver'supplies for sale. One of those sad occassions where old age now means that it's time to sell off all the equipment and do-dads of a weaving life. Your happy purchase is their sorrow. That day will come for each of us one day. The collection included *many* books and papers from a weaving interlude dating from the mid 1970's to late 1980's. I was able to add many amazing collectible and out of print books to my library and then sold many more. I still have some sitting here that need new homes. Among the papers, were a series of weaving swatches by the Victoria Guild from the early to mid 1980's. The colours are dated but the weaving information is fabulous! Great inspiration when the 'grey matter' runs dry. I have over 4 three inch wide binder full of swatch exchanges from various guilds, my own weaving, plus my friends'. I never tire of looking through them. They are so simple to make: just add an extra 12 inches to your next project. I then draft up the design and weaving notes in my PCW Fiberworks program and hit print. One friend said she loves getting 'the big brown envelope' that arrives suddenly in the mail and there are my last 6 months worth of projects to share. Below is one swatch from the Victoria collection that is extra special. The guild handed out this sample in 1984. The material is from old curtains woven by a long time guild member way back in 1938 for her mother. Now doesn't that tug at your heart strings! The two pictures are my attempt to show clarity of the summer and winter weave structure as well as the colours. The colours run in value somewhere between these two images. I think this book is on most weavers' book shelves. But when have we *really* looked at it? Some times it takes a small treasure like the swatch to nudge us into a second (or even a first!) look. We wait for the latest new weaving books to be announced by the various publishers with their shiny covers and glossy pages. But perhaps a backwards glance is even better? So it seems our heat wave was a short term thing and we are back to a more normal range. Blankets off, then blankets back on the bed and there's the chilly house in the mornings. Things weatherwise are not 'business as usual'! There have been some discussion on other blogs and chat groups about keeping track of where you are when weaving a project. I've seen pictures of tape measures pinned to the selvedges and also cash register tapes rolling along. These will mean that the weaver is weaving to the exact measurement they need *provided* they allow for take up. If they don't, it will come up short and how much depends on the grist of the yarn used, their beat and the warp's relaxation once it comes off the loom. 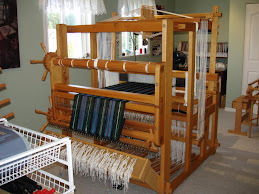 I had a mentor tell me that if the length is critical, such as in a piece for a test program, then relax the warp on the loom and measure it the next day. That will be a better guide to what you have. I simply measure along the edge of the selvedge and place a large loop of scrap yarn in at a measured point. On a sheet of paper, which I keep in the loom bench, I have a note of how long the towel planned to be and allowances amde for things such as hems, borders etc. In the towels currently on my loom, they are to be 34 " long total. I would weave 4" for hem, then 2"for a border, then I'm weaving the main part of the towel. BUT I must subtract for the other hem and border so 6" x 2 = 12" Take 12 away from 34 and the main part of the towel will be 12" before I must start the opposite border, then hem. Each new planned section is easy to track as I go along, armed with my plan, pen and paper. I had already factored in take up into the length I want for the towel along with shrinkage after wet finshing. Here's a picture of a towel where it's to be 34" in length and there are no borders. Simply 2/16's weft in mercerized black cotton. All I need to do is to track inches woven. I measure what I have woven new and move the cotton loop. The new inches are added to the previous total and I make a new total. As a friend says "easy peasy". My tally sheet..... showing towel #7 and to be 34" total, with my additions. I measure often as right now I must move the work frequently to prevent me from leaning forward over the work. My physiotherapist has ordered no leaning forward and adding strain to my lower back. Since I want to weave, I do as I'm told! I hope you give this a try and see how you like it. It will take some getting used to if you have been using other methods. Every time the cotton loop rolls over the edge of the breast beam, simply measure and move it. Now, onto other things... In 2007 I attended Fibre Fest and had a grand time. I took a fine spinning workshop by taught by my friend Judith Glibbery. Great course and helped my spinning immensely! I wandered the vendor area and brought home some treasures: such as painted bamboo skeins from Laura Fry's booth, cashmere silk blend spinning fibre from Jane Stafford's booth and I even bought some small bobbins with the new merino wool and stainless steel yarn at Fibres Plus. Not sure what I will make with that but who knows! I'm trying to stay current with the new yarns out there. I also bought books.... I *love* books. I keep looking for classic titles that I need for my library and also to see if any of the newer releases are worth snapping up. This book pictured below is one such book! The ISBN # is 0-9611136-2-6 and my copy is dated 2005. I paid about $45.00 and it's well worth it. Self published by Doramay Keasbey and the address given is Eugene, Oregon, USA. It's a large book of about 300 pages and filled with crisp, clear black and white pictures, drafts and well written text. I'm finding it to be an amazing resource! Why isn't this book more talked about among the weaving community? It covers historical aspects and then quickly moves onto every possible type of pattern weave you could imagine. This was a labour of love for Ms. Keasbey! I would say it the best book I have bought recently besides Anne Dixon's new one on 4 shaft weaves. It's a keeper!